Owning a home has long been part of the American Dream. But it can be difficult. For new homeowners, hundreds of questions quickly surface: Can I afford to buy a home? How do I learn about mortgage options? What is PMI? What if I don't have a downpayment? Current homeowners face questions as well. Involuntary changes to the household budget can present many obstacles. How do I adjust my budget? What bills are priority? I'm behind on my mortgage payment, what do I do? We are certified to help! Mid Michigan Community Action's Homeowner Empowerment Program meets homeowners at all stages--from the first-time homebuyer to long-time homeowners. We are firmly committed to providing the best possible service. 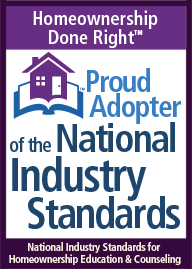 We are certified adopters of the National Industry Standards for Homeownership Counseling, Homeownership Education, and Foreclosure Intervention. Our staff are certified by the Michigan State Housing Development Authority and by NeighborWorks America.